Full credit for the first ever BJP victory in Tamil Nadu goes to a Bengali Kayastha named Narendra Nath Datta (who shares the same first name as the new Badshah of HINDU-stan). Now we know why Pankaj Mishra has been so much up in arms about the rise of the neo-Hindus, by which he means the Shudras and the Dalits who have voted for the Party of Manu and against their co-brothers (muslims). Normally such behavior makes no sense - as per the traditional Hindu rule book these folks are considered as lowly people. In Marxist lingo this is explained by the theory of false consciousness, whereby poor, deluded people vote against their self-interests. Except that this is only a partial truth (and Pankaj knows it). The deeper picture is that the super-castes have lost control of both RSS and the BJP and it is the Shudras who are on the ascendant. The Shudras voted for their maximum leader (who relentlessly claimed his OBC status in public). The Dalits voted against Mayawati because she gave support to the Congress/UPA (this explanation according to Mayawati herself). The rejection was so utterly-butterly complete that the BSP was completely wiped out. The middle class voted against Congress because of the taint of corruption. As far as the effect of polarization is concerned, yes, it was very much on evidence...on both sides. The neo-Hindus mobilized against the neo-Muslims (who threatened that another partition is forthcoming if Modi comes to power). So who is going to lead the new movement of Mohajirs and where are they going to go? Pakistan has (for decades) steadfastly refused to absorb a (relatively) small population of Bihari muslims from Bangladesh, who still languish in ghettos and are despised by their fellow Bengali muslims as quislings and traitors. We should ask these poor souls if the golden dreams of ideological movements have been worth the personal sacrifice that they have made. If they are also infected by the virus of false consciousness, they will probably reply in the affirmative. Thus it is necessary to destroy (muslim) villages to preserve the (muslim) nation, a direct message from the Bhagavad Gita (Pankaj can check this out). So, what explains then the victory of the BJP in Kanniyakumari? We have several friends from Thirunelveli, Tamil Nadu, which is about 100 km away from Vavathurai (land's end). Our friends used to be staunch DMK voters, this time to a man they have voted for Amma. But things are different in Kanniyakumari. For the RSS this place is holy land, in line with the wishes of Swami Vivekananda (PM duly fingers him as a major villain) and in opposition to the Christian fishermen who populate the area. The back-story from Wiki is excerpted below. The RSS mobilized in Kanniyakumari in a way it was unable to achieve right next door in Thiruvananthapuram, Kerala (see comments below). That is in part because the Left did not lose control over their OBC vote-bank (Ezhavas) in the way Mayawati lost her flock. But the Left is dying and the time will come when the neo-Hindus make their mark in Kerala as well. It is just a matter of time (and being patient). 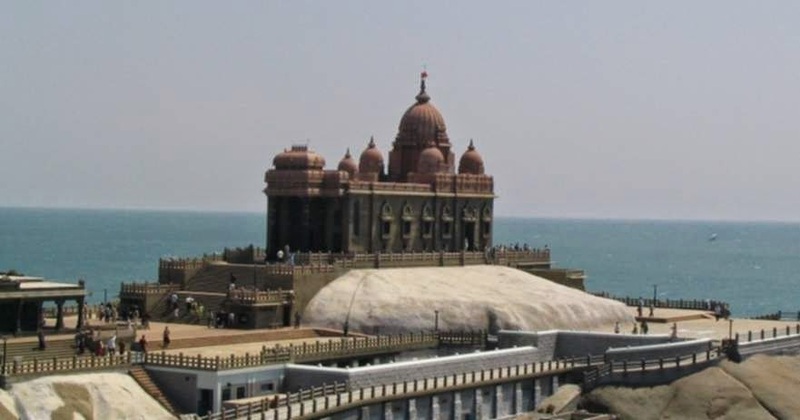 Vivekananda Rock Memorial is a monument and it is a popular tourist attraction in Vavathurai, Kanyakumari, India. The memorial stands on one of two rocks located about 500 meters east off mainland of Vavathurai, India's southernmost tip. It was built in 1970 by the Vivekananda Rock Memorial Committee in honour of the visit of the Hindu spiritual teacher Swami Vivekananda to Shripada Parai during the month of December 1892. It is claimed that he swam to this rock and meditated. It is said that he attained enlightenment on the rock, and henceforth became a reformer and philosopher. A meditation hall (Dhyana Mandapam) is also attached to the memorial for visitors to meditate. The design of the mandapa incorporates different styles of temple architecture from all over India. It houses a statue of Vivekananda. The merger of three seas - Bay of Bengal, Arabian Sea and Indian Ocean can be seen from these rocks. In January 1962, on the occasion of Swami Vivekananda’s birth centenary, a group of people formed the Kanyakumari Committee whose objective was to put up a memorial on the rock and a pedestrian bridge leading to the rock. Almost simultaneously, the Ramakrishna Mission in Madras had similar thoughts. However, this news was not taken in good taste, by a sizable population of the local Catholic fishermen. They put up a big Cross on the Rock, visible from the shore. The Government realised that the Rock was turning into an area of dispute with Hindus claiming it to be the Vivekananda Rock and Christians that it was St. Xavier’s Rock. It decreed that although the rock was Vivekananda Rock, there would be no memorial constructed on it. The then Chief Minister of Tamil Nadu, Shri M. Bhaktavatsalam, said that only a tablet declaring that the rock was associated with Swami Vivekananda could be put up, and nothing else. With government permission, the tablet was installed on the Rock on 17 January 1963. But the voices clamoring for a full-fledged Memorial on the Rock did not die. In May that year, those seeking vengeance for the removal of the Cross, demolished and threw away the tablet into the sea. The immediate obstacles were Shri Bhaktavatsalam’s stand that he would not allow the memorial to come up as Shri Humayun Kabir, the Union Minister for Cultural Affairs, had said that the natural beauty of the Rock would be spoiled. Shri Kabir’s constituency was Calcutta. When Shri Ekanth Ranade publicised in Calcutta, that it was Shri Kabir who was against the creation of Memorial of one of the greatest sons of Bengal, there was such a hue and cry that Shri Kabir had to do a volte-face. However, to prevail over Shri Bhaktavatsalam, only the Prime Minister Jawaharlal Nehru’s support would do. To that end, on Shri Lal Bahadur Shastri’s advice, Shri Eknath Ranade camped in Delhi. In three days, he collected the signatures of 323 Members of Parliament in a show of all-round support for the Vivekananda Rock Memorial, which was presented to the Prime Minister. Shri Bhaktavatsalam had no option now but to allow the construction of the Rock Memorial. Shri Bhaktavatsalam had given permission only for a small 15’ x 15’ shrine. Knowing his reverence for the Paramacharya of Kanchi Kamakoti Peetham, Shri Eknath Ranade approached the latter for suggesting the design of the Rock Memorial. Shri Bhaktavatsalam unhesitatingly agreed to the larger design (130’-1½" x 56’) approved by the Paramacharya! Once all the political hurdles were removed, construction was underway. The biggest and ever present challenge, however, was that of financing the whole operation. Shri Eknath Ranade believed that as the Vivekananda Rock Memorial was a national monument, every Indian should be invited to contribute to its construction. He approached (and succeeded) almost every State government and asked for their contribution, making a special effort to go to the north-eastern states of Nagaland and Arunachal Pradesh so that they could also feel a part of the national endeavour. But the bulk of the contributions came from the general public. Shri Eknath Ranade launched the campaign of one-rupee folders throughout the nation, which were used to mobilise the donations of the common man, starting from as tiny an amount as a rupee. Thus so many people visiting the Rock Memorial could feel with justified pride that they too had contributed to that monument. 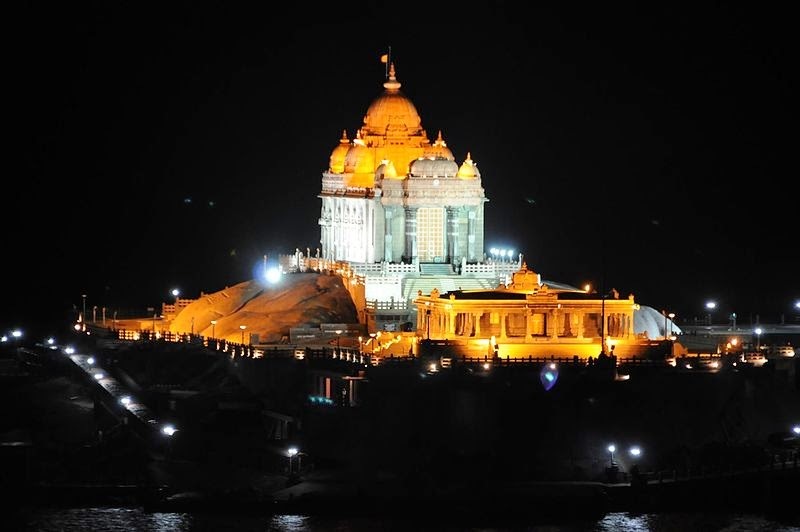 Ultimately, within the unbelievably short period of six years, the Vivekananda Rock Memorial was inaugurated in 1970, and dedicated to the nation. Without the leading role of Shri Eknath Ranade, it is extremely doubtful that this grand national monument could have been built. Apparently, Kanyakumari is a Congress stronghold. It has upwards of 50% Christians if I am not mistaken but their votes got divided among other parties while BJP won riding on the NaMo wave. Same thing happened in Muslim-dominated UP constituencies. BTW, It might interest you- another case of Christian extremist vandalism was the complete destruction and desecration of the Sabarimala temple in 1950 (in the off-season when it is abandoned) . The ensuing investigative report was so sensitive that the pseudo-seculars (Congress) buried it when it got finished after 7 years of investigation. The Communists then picked it up and vowed to release it as an election promise- which they did after they came to power. I dont understand what is so objectionable about Swami Vivekananda from the secular POV. He really didnt bash Islam or Christianity at their fundamentals like Sitaram Goel or Shriram Swarup did but just pointed out that their criticisms of Hinduism(polytheism vs monotheism) were clumsy and self serving. Indeed he praised Islam,Mohammad and Jesus. He was not a Hindu nationalist as is understood by even the mainstream members but a Hindu revivalist. Certainly he inspired a lot of Hindu nationalists such as Savarkar but you cant hold that against him. Jeez the problem with seculars is that like other fundamentalists is that they are a zero sum people. If there is Hindu pride, they assume it comes at the cost of Muslim, Christian or secular pride and since Hindu = retrogressive,reactionary,oppression therefore any Hindu pride has to be crushed. With every idiotic article by Pankaj Mishra, it shows that he has learnt nothing from the recent debacle . Indeed I would throw him and bigger shovel so he can keep digging a more spacious grave as will be required for his ideological ilk. Christian Nadars dominate Kanyakumari and are also a decisive factor in Thiruvananthapuram. The left put up a Christian Nadar in Tvm, and this nearly cost Sashi Tharoor his seat. If you compare his 2009 vote share to this year, this difference can almost entirely be attributed to this. In Kkumari, the three major contenders were all Hindus. Unlike in some previous elections, the Church (CSI) did not come out in favor of any candidate. Pon Radhakrishnan, the state BJP president, is a Nadar (and thus fits PM's neo definition). He had been quite active in moderating Hindu-Christian tensions in the district in the past, and was thus acceptable to the Christians. I asked a Christian from there how come the BJP won and his answer was "Pon is a good guy." 2. It has a literacy of 83%. 3. Unlike the rest of the state, the district has a large minority population (44.5% Christian and 5% Muslim); hence, it resembles Kerala in being literate, communalistic and having a large number of workers in rubber, cooconut and in the miodddle east. a larger area there. The people of Kumari district had not heard of Vivekananda in the 70 year interregnum! There is no Dravidan party in this state; essentially Congress (through nadars and Christians) winning the LS constituency from 1951 through 1999.Then, a series of riots against Catholic Fishermen, muslim coconut growers transformed this constituency to a communalist place. During this time, some leaders like Helen Davidson switched to DMK, and DMK won for the first time ever in 2009. The current winner is Pon radhakrishnan who is the one BJP guy in the state who can actually win an election. This electoral success has not transferred to the assembly; BJP has not shown it can win any assembly constituencies. The whole Vivekananda character has had no impact on the district in any way. "There is no Dravidan party in this PART OF THE state;"